"My husband and I are following the guidelines of the Virgin Diet (no gluten, soy, eggs, dairy, peanuts, corn, or sugar) and wanted to experiment with some new ways to eat quinoa. We love guacamole, and decided to transfer the ingredients into this healthy and flavorful quinoa dish." Heat olive oil in a saucepan over medium heat; cook and stir onion and garlic in the hot oil until slightly browned, about 5 minutes. Stir quinoa into onion mixture and cook until quinoa is lightly browned, about 30 seconds. Squeeze lime juice into a 2-cup measuring cup; pour in enough chicken stock to make 2 cups liquid. Pour chicken stock mixture over quinoa and bring to a boil. Reduce heat, cover saucepan, and simmer until liquid is absorbed and quinoa is tender, about 15 minutes. Remove saucepan from heat and chill in the refrigerator, about 1 hour. 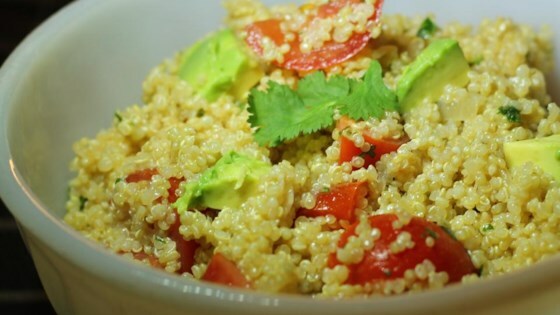 Fold cilantro, tomatoes, avocado, and jalapeno pepper into quinoa mixture. Return quinoa to refrigerator for flavors to blend or serve immediately. Adding the avocado to the quinoa mixture while it is hot may cause browning. For a toddler-friendly version, omit the jalapeno. It's nice, light and fresh. Really easy and quick. I didn't make any changes to it, but I think I will take Heather's suggestions next time. Maybe it was too much like but I didn't care for it. Great! Refreshing! I used 1/2 can diced tomatoes and 1 mild hatch green chile from the can (gluten free).